"Perfume is subjective", I hear all the time. What's heavy to one is light to another, what is pleasantly sweet to certain individuals can be overly sweet. Probably because we haven't really agreed on which terms to apply so that we have a codified language to describe scents. True, we use "fragrance families" taxonomy to distinguish them (floral, woody, chypre, aldehydic, leather etc.) and sometimes we borrow from taste (sweet, bitter, savoury/salty, sour) but what happens with more esoteric terms, like "powdery" scents or "dry" ones? Google search "powdery dry perfume" and you will see in the top five results the mention of Guerlain's Chamade. Now, Chamade isn't particularly "dry" nor is it particularly "powdery" except in the end. I mean, sure, one could detect these nuances to some degree, but my mind would gush forth hundreds of other suggestions for fragrances before mentioning Chamade. Unless we're thinking of the slang term "dry powder" for cash reserves for an unforeseen difficulty, in which case, yes, Chamade is a great asset in the war against industry mediocrity. But I digress. So let's break down the terms, starting with "dry" since it's the more inclusive one. "Dry" is a term that can denote two things in English: the opposite of sweet (as in wines) and the opposite of humid (Just like "light" can mean the opposite of both heavy and dark). In the latter sense, it's easier to grasp the context: Dry fragrances don't have dewy, watery, acqueous elements that recall crisp vegetation, any expanse of water or dew drops on petals. They can be mineral-like and they keep you dry as a result. Think of woody scents full of cedar, sandalwood, oak, rosewood, birch... Like the trunks of trees and their barks, they have a solid "appearence" to the nose. Think of smoke and some kinds of incense. The opposite of non-sweet when refering to "dry" fragrances is a little more elaborate to explain. Think of a fine dry wine which has a minimal residual of sugars. Taste a fine white Reisling and compare with a full-bodied Sherry. And later on, within those categories, try to detect the degrees of dryness or sweetness between a Fino and an Oloroso Seco. Tannic notes give a taste of dryness which bites the tongue (in a non-spicy way). Same goes for fragrances: In his couture shop at 7, rue Saint-Florentin, couturier Jean Patou had the brilliant idea of creating a cocktail bar where men could drink and small-talk while their women shopped for their dresses. 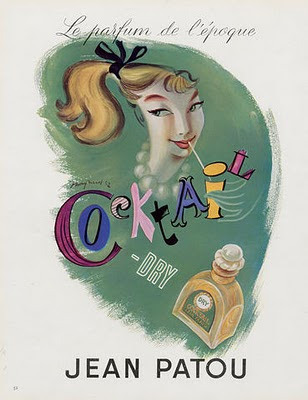 In 1930, Patou decided that this could be converted into a veritable perfume bar and Henri Alméas, his perfumer, was instructed to create "cocktail" fragrances: The results were the original Cocktail, Cocktail Dry, Cocktail Sweet, and Cocktail Bitter Sweet. Clear enough? It's not accidental that most masculine fragrances aim at "dry"; it denotes a certain butch element! Dry notes in fragrances are usually provided by woods or some grasses (for instance vetiver), by rhizomes (orris/iris), by phenols (tar-like essences such as birch tar, guiacwood, leathery compounds), by mosses (oakmoss, treemoss). There is no restriction as to which family they might belong to, though: Try the oriental Tiempe Passate by Antonia's Flower, the chypre Aromatics Elixir by Clinique, the woody floral Ivoire by Balmain, Chanel's green floral No.19, the aldehydic Pure White Linen by Lauder, the mineral cologne Eau de Gentiane Blanche: They're all non sweet, non humid, they will keep you dry on a warm summer's day. And powdery, you ask? What does it signify when talking about fine fragrance? "Powdery" can be a subcategory of "dry", as powder by its very nature abhors moisture. Yet powdery can take sweeter nuances or drier ones, according to manipulation by a talented perfumer. It also hints at a feminine rather than a traditionally masculine smell, evoking as it does a million "cute" acoutrements: feather boas, white kitten fur, cosmetic enhancements and 18th century peruques, pastry making involving flour, and fluffy angora sweaters in pastel colours. Usually the categorisation is between "face powder" or "talcum powder" (also described as "baby-powder"). Face powder notes are more refined in feel and overall less sweet with a vintage, "perfume-y" trail, while talcum powder is simpler, usually involving a comforting, vanillic backdrop that recalls the famous lemon--lavender-vanilla accord of Johnson's Baby Powder. The no doubt amusing dichotomy of powder evoking both grandmothers (through the association with the scents they carried on from their youth) and babies is probably fodder for a psychology thesis on how smell perception is the most perverse within the human brain function. For the scope of our column, let's give some examples to clarify our point. Face-powder-smelling fragrances include Hermès 24 Faubourg, Ombre Rose by Jean-Charles Brosseau, No.19 by Chanel, Patou's discontinued Normandie, Creed Fleurs de Bulgarie, Jolie Madame by Balmain, Coriandre by Jean Couturier and Ma Griffe by Carven. Talcum or baby-powdery fragrances have an artistically acclaimed representative in Petits et Mamans by Bulgari, a cuddly powdery scent which truly charms. Cashmere Mist by Donna Karan and Flower by Kenzo are the rather grown-up version, aromatized with a little jasmine for the former and a clearly detectable synth violet for the latter. Try Teint de Neige by Lorenzo Villoressi: choke-full of powder! Surely a firm favourite of power loving folks! We had talked about ambery fragrances which often evoke a powdery effect the other day, some of the ingredients involved into giving such an ambience being amber mixtures, opoponax gum (such as in the case of Shalimar), heliotropin, vanilla and several musks (try Habanita by Molinard, Must de Cartier in pure parfum, Kenzo Amour or Obsession by Calvin Klein to see this. And see how white musks can be powdery soft in Clair de Musc by Lutens). But powderiness can be also rendered through orris/iris (Iris Poudre even says so in the name), certain aldehydes (read more on which on this article), Iso-E Super when combined with certain musks and most importantly mosses (like in Aromatics Elixir, Ma Griffe, Chanel No.19, Knowing by Lauder, Coriandre, and Piguet's Bandit). Moss contributing to the effect is an interesting case of chance discovery. I was puzzling myself for years trying to figure out why moss reminds me of my mother and of face powder. 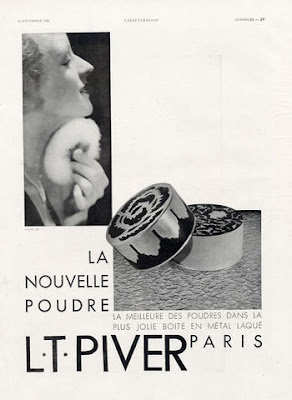 I am not alone, lots of women associate it specifically with vintage poudre de riz face-powders imagining them being slowly, decadently, glamorously fluffed on with ostrich-feather puffs by film noir heroines before they go out to wreck havoc on some poor men's lives. Powders from Cyprus I knew were based on the famous "recipe" of chypre perfumes. Until one day strolling the Max Factor counter I stopped to read the actual ingedients on a couple of compacts, one of them being Creme Puff which both my mother and grandmother used with a wide brush for setting their makeup. Yup, prominently displayed was Evernia prunastri, otherwise known as...oakmoss! Which are your favourite dry &/or powdery fragrances? Definition: Which Material Produces Which Note/Effect? 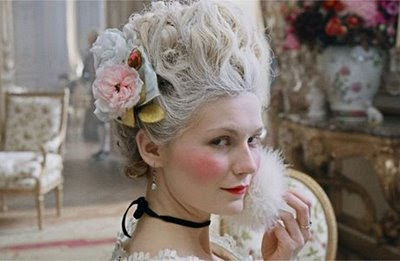 Still from the film Marie Antoinette by Sofia Coppola, featuring Kirsten Dunst via Hansen Love blog; Jean Patou Cocktail Dry and L.T.Piver powder ads via hprints. I just tried Let Me Play The Lion by Les Nez and I liked the very dry feel of it, maybe from the cedar and frankincense. I don't think I'm a big fan of powdery though. Maybe Bvlgari Black? The vanilla makes the leather in that sort of powdery. The driest perfume I've ever smelled is Hermes Eau de Gentiane Blanche and I adore it! Powder- Le Labo Aldehyde 44. Your posts are fantastic - so informative. I've been lurking for a while now. I'm glad you noted the baby power oakmoss connection. I recently bought a decant of Odin New York 03 Century because the main note was oakmoss, and I wanted to find out what it smelled like. While I love the fragrance, all I got was baby power and what I remember of Loves Baby Soft, and now I know that to be expected. I love powdery fragrances! My current favorite is Byredo Gypsy Water, and I also adore the rice powder note in Equistrius and the face powder note in Putain des Palaces. Vanilla/sandalwood combinations seem powdery to me. The only full-on powder blast of a fragrance that doesn't work on me is Teint de Neige - it's like being trapped in a talcum snow globe. Back home in America for a visit, I was rummaging through my mom's guest bathroom's cupboards, and found a 20+ year-old bottle of Chanel's No. 22. It was in perfect condition and it is the epitome of the pleasant type of powdery scents: the powder aspect is kept from becoming matronly by the brightest, whitest imaginable floral and aldehydic notes. Very classy, very Parisian, very much the olfactory quintessence of a bright summer morning in Paris. The old Guerlains, by contrast, don't have the same brightness and sink in powder; they always smell like the old ladies I'd see as a kid, dressed up in their city furs and suits, but far too heavily made up and reeking of extremely strong powdery perfumes from a hundred yards away. I know this sounds like a terrible generalization, but it's always what I get when I'm at the Guerlain counter at the Galeries Lafayette or their boutique. Anyway, thanks for your post; another winner! There's oakmoss in face powder and baby powder?! Thanks for a very informative post, E! My favorite fragrances usually are neither very dry nor very sweet...nor very powdery. There is only one very dry fragrance that I enjoy very much: Chene by SL. It opens all sweet and boozy, but the dry down looses all the sweet/humid connotations and feels like dry sands, with the bitter astringency of tanninic residue. As for powdery, my favorites are Une fleur de cassie, chamade, Vol de nuit, van cleef and arples un bois d'iris and la XIIIème heure de cartier. I don't usually like powdery notes, but as you can see I have found many exceptions to this rule! "(like in Aromatics Elixir, Ma Griffe, Chanel No.19, Knowing by Lauder, Coriandre, Piguet's Bandit)"
I don't see Chamade as "powdery" either. Not a "powder" girl myself but , isn't it great how other people will love this and that !!! My favourite dry perfume would have to be the cryptic Djedi of Guerlain. The opening blast of cold dirt must be one of the driest notes in perfumery. I do think, however, that Djedi does betray its initial and final aridity with one of the most luscious roses in the middle; a rose that has nothing to do with a dusty bowl of pot pourri and is more akin to a sweet, dewy blossom at its lushest peak, a very brief moment in time. oh yes, this one by Les Nez is incensy and dry. Like it very much! How did I forget about it? I'd agree enthusiastically on Gentiane Blanche: bone dry like white rocks in the desert! LOVE it! Wasn't too taken with Le Labo's take, maybe I should retest. welcome here, hope you stop by and comment often. And thanks for the very kind words! "being trapped in a talcum snow globe" for Teint de Neige is such a powerful, memorable image! Thanks for bringing this here. Lovely, interesting choices for the rest, the Putain is quite refined for what it's named, eh? There is definitely a divide between the Chanel and the Guerlain aesthetic: the tradition of aldehydes for the former, the patiserrie allusions for the latter; like you say. I like them both, but wear them selectively and for different moods. Funnily enough, even though Chanel No.22 is everything you describe, it was originally conceived to be geared to American women who preferred more polished, more proper and less "animalic" scents with a sweeter feel. Interesting, no? amazingly enough (for all the IFRA reasons one can state), yes! Labels don't lie (not yet at least). Haven't checked baby powders in such detail though; I mentioned face powder for certain. you literally read my mind. Soapy fragrances was the next category of esoteric categorisation I would tackle. And so I have! Thanks for a most opinionated and interesting comment! thanks! Very interesting thoughts: Could it be that the "old grandma" association is deterring men from "powdery"? I would assume it would be most undesirable to the average man, unless trying to evoke a happy memory on said grandma's knee for a special trip down memory lane. You're right that some spices give off a dusty feel, so does incense (all that smokiness). Funny though, I hadn't thought of L'Air de Rien as powdery or dry in the sense that some of the others are. It's slightly sweet to me, I get more of the musk than the oakmoss. It's gorgeous, isn't it? As to bitters going out of fashion, *sigh*, tell me about it. It seems literally everything nowadays is literally or metaphorically dosaged with an excess of corn suryp!! Will they ostracize everything "bitter" and thus considered unpleasant too next? Aubergines, bitter almonds, odd tasting drugs, melancholy and assymetrical facial features? I LOVE your choices for powdery! As to Chene, you have exceeded everything I could come up with: brava! It's personally fascinating to watch and hear!!! Yes, that rose! My skin seems to intensify and sweeten florals to such a degree that I do not like florals on me; it feels as if I have buried my face in a suffocating bouquet of whatever bloom is featured. That said, when I wear a fragrance that is not "floral", whatever floral note it does contain seems to sing at just the right pitch, softening and civilizing the bitter notes I love. So yes, Djedi behaves beautifully for me. It probably helps that I have a wee sample of the vintage extrait so I wear it only rarely. Frankincense to me is the epitome of a 'dry' fragrance. There is almost nothing sweet about it, it seems to distill the essence of the deserts it grows in. It smells to me like hot sun on golden dunes of sand, radiating endlessly from a cloudless electric blue sky. I've also found that a combination of styrax and tonka bean has a 'baby powder' effect. what a beautiful picture you're drawing! I agree on the dryness of frankincense, a note I absolutely love, though in perfumery it's not often used as a "drying" material. Don't know why, probably because other notes that usually accompany it provide that dryness more effortlessly/cost effective? I absolutely adore your suggestion of styrax and tonka bean, though, yes! Great article! Really glad I came across it! I have an odd question that I feel you may be able to help me with! Every perfume I try on ends up smelling like "Old Lady" or powdery and also like the bottle is old, and it just smells "perfume-y" (if that makes sense..)Fruity, Musky, Floral... it all smells the same once I put it on and wait 5 mins. I used to put it to my pulse points, but I have read your articles and so now I wear it on my front neck. But as of yet, I am confined to wearing it on my clothes since it does not seem to interact well with my chemistry. Do you have any ideas for me on what I could try, what notes to avoid, so I can find a nice scent to wear?